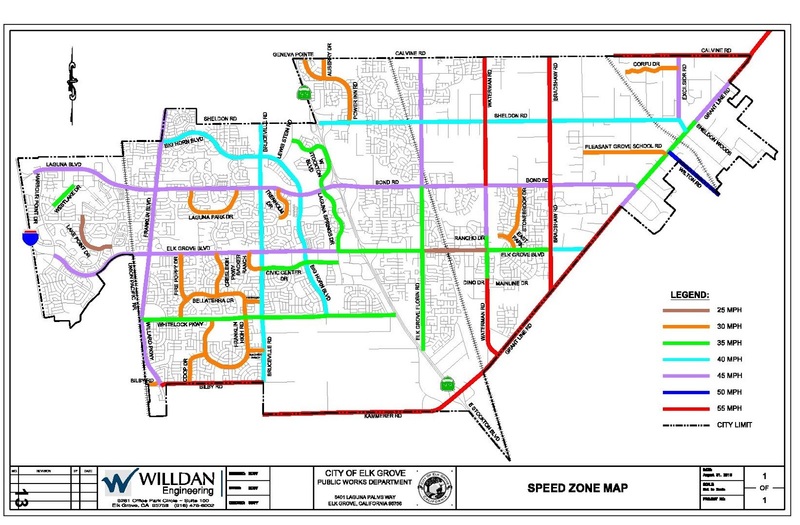 At Wednesday night's meeting of the Elk Grove City Council, a sensitive issue for many motorists will be considered - should speed limits on the city's main thoroughfares be reduced. Council members will consider lowering speeds on several roads in the range of five to 15 miles per hour. Speeds would be reduced by five-mile per hour on 28 street segments, 10 on four segments and by 15 on one segment. Under the proposed changes, Waterman Road between Rancho Drive and Dino Drive would see speed reduced 15 mph. By state law, counties and cities are required to set speed limits within their jurisdictions and that they be based on engineering and traffic studies. The numerous proposed speed reductions are based on recent studies conducted by the city. 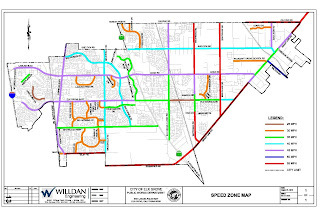 The staff report notes that the speed limit of 50 mph on Waterman Road between Rancho Drive and Dino Drive was established prior to incorporation. In justifying the 15 mph reduction, the report says "this segment has become more urbanized in the past few years, resulting in an increase in vehicular and pedestrian activities." Other notable proposed reductions include Franklin Boulevard from Elk Grove Boulevard to Whitelock Parkway, Excelsior Road from Sheldon Road to Calvine Road, and Waterman Road between Bond Road and Rancho Drive. Speed limits on all three segments would be reduced by 10 to 45 mph. Should the city council approve all the proposed changes, it is expected to cost $10,000 and would be paid from the city's existing street maintenance funds. The new speed limits would become effective 30 days after adoption. Wednesday night's meeting will be held at Elk Grove City Hall and starts at 6 p.m.
Years ago, the folks in GSREHA and SCA rallied to get the speed limit lowered on Sheldon Road. Originally it was 55 miles an hour. That was fine until Elk Grove grew and Sheldon Road was then used as a thoroughfare to Bradshaw and Grant Line. People would speed upwards to 65 miles an hour. We got it changed to 45 mph and the result, a lot of people now travel the original 55 mph. Once in a while EGPD does a speed operation on Sheldon Road between Waterman and Elk Grove-Florin, which is near my home, and they can’t pull people over fast enough. So in our case, it was a good idea to lower the speed limit. The sad truth about any law is that “good people do not need laws to tell them to act responsibly, while bad people will find a way around the laws". 30 - 40 & 50 MPH is just not in our thinking process. They say reducing speeds will have to come with more speed bumps and increased enforcement. Cha-ching. It seems everything we do is over-thinking the fix. While I agree there are 2-3 streets that might need a change, but the whole darn city...NO WAY! "groupthink" has waay too much time on their hands. A better idea would be to get the speed limit reduced on Hwy. 99 to 25MPH so visitors will have time to read those Destination City 60' billboards. I trust the City Council's judgement on what the speed limits should be. I am also in favor of having my taxes raised to patch all the potholes so our city looks its finest. Whitelock Parkway at 35 MPH is absurdly slow...heck, it's a Parkway! It was built for higher speeds and especially with one side having very few cross streets (due to a canal), the speed limit should be higher there. Laguna Blvd. needs one of those slow-down changes. There is one especially hazardous pedestrian crossing at the trail near Peet's Coffee. I have literally been within inches of being hit by a car two different times zooming along, probably at the speed limit, who did not heed the stop light for pedestrians which is midway between two large intersections. I cross there often on foot, as this is where the two parts of the trail intersect and also to stop in at Sprouts and the Farmers' Market. Everybody - be very careful there!!! Cars approaching that pedestrian light go really fast with no thought to stopping for walkers. If I have had near-misses, you can imagine how many others have had the same experience. Drivers unfamiliar with that stop don't even see it coming! Drivers speed and jackrabbit start from signal to signal because Elk Grove can't even get their traffic lights synchronized. How many times have you obeyed the speed limit and hit one red light after another? The only way to avoid this is to blast off at one of the lights and try to catch the next light while it is still green. Looks like someone got a little overzealous with the rules. Isn't Whitelock the street we've been having hearings about making it the big Interchange...35 MPH is way too slow for that street. I also noticed that on Elk Grove Blvd. from I-5 to Grant Line there are 5 different speed zones, but only one speed zone for all of Laguna Blvd. which is also heavily traveled with shoppers and pedestrians. These changes should be made slowly, not at one time for a whole city. One new stop sign takes a while for people to get used to as well as a lower speed limit. We always seem to have to go BIG or nothing at all...go slow on the changes! Give us a chance to get used to them slowly. I ageee about Whitelock. 35 seems slow given it's a divided 4 lane road. 40 seems reasonable. The traffic lights are synchronized. However, requests from perpendicular travelers (vehicular and pedestrian) temporarily cause the lights to get out of synch. This occurs mostly during high traffic hours... Such as rush hour or school dismissal. If drivers jackrabbit and speed, it has more to do with them being ignorant of law, safety and fuel economy than the synchronization of the lights. The most important change for Elk Grove are "speed limits?" Heck all we've got are empty buildings and "Coming Soon" signs all over town and that's the best we can do, change the Speed Limits? How about cleaning up the streets, getting rid of some of those advertising signs, brush-hog some weeds along the roadway or we'll never be able to see the speed zone signs. Need to put that agenda item on the back burner until you clean up the city. We're looking brown and dirty and not because of the drought, although that doesn't help. To above: there is technology out there that would deal directly with traffic changes etc that would accommodate for various traffic conditions. However, since our city does not have money to repair roads I doubt they have the money or engineers available to handle sophisticated technology. With all due respect to Lynn, the City Council is handling traffic safety effectively on various fronts: Speed limits so I can easily spot which stores I wanna visit; police patrols to stop people from texting and talking on their cell phones which seems to be working because I hardly see people on their phones now; and red light intersection cameras to not only spot red light violators, but scan license plates to keep the bad guys out of our town. Elk Grove is the gem of the Sacramento Valley and we have our elected leaders to thank for that! "Speed limits so I can easily spot which stores I wanna visit". That's a good one. Wonder if that is why I have so many people honking their horns at me? Hope they don't pass some law making that illegal too.